I am finding these tiny bugs in my kitchen. They are about the size of a small pin head and kind of clear/amber and move very fast, have big eyes and are CREEPING me out!! Moved from Unidentified eggs, nymphs, and brachypterous adults. Why can't I find critters like this in my house?? Not sure what these are but I sure wish I had some in alcohol to play with and identify. If you would consider sending me some of these I'll give you my address. 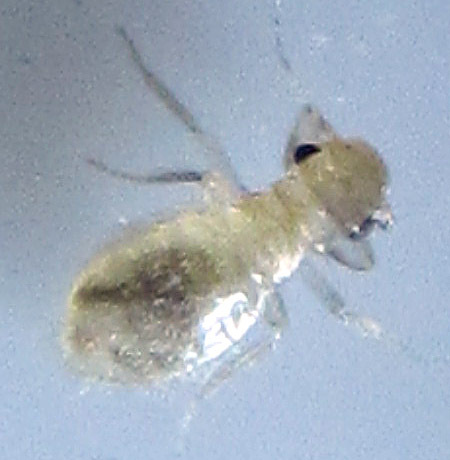 psocid of sorts, may be Trogium pulsatorium... neat bugs.